Photo by Zach St. George Fernbridge from the Ferndale side. Photo courtesy of the Ferndale Museum Looking down on Fernbridge from the hills on the east bank. Photo courtesy of the Ferndale Museum Workers built wooden falseworks to pour the concrete over. Once the concrete set the falseworks were removed, leaving the bridge in its current form. Note the temporary railway built to deliver concrete from a factory on the east bank. From below, on the dusty Eel River floodplain, Fernbridge looks solid but graceful. The bridge is concrete -- in concrete's most statuesque form, with soaring arches and tapered columns. Nearing its 100th birthday, the span is also one of the longest and oldest reinforced concrete bridges still around, local engineers and historians say. This bridge from a bygone era of engineering, normally a perilous spot for strolling, will be briefly closed to traffic on Sunday, so that anyone who cares to celebrate its centennial will get the chance to walk, run or hop across all 1,451 feet of it. "It's a pretty impressive structure," said James Van Bonn, an engineer and maintenance coordinator for Caltrans District One. "One of the ways that engineers used to do things before they had computers to analyze things is to overbuild, and so Fernbridge is beefed up and overbuilt." Take for example the bridge's massive footings, where the columns meet the riverbed. "They would say, if one square foot is sufficient, make it 1.1," he said. Today, on a similar bridge, the footings would probably be skinnier. Computers save time and money by allowing engineers to trim off that extra .1 with in-depth structural analysis. But there's a downside to that efficiency, said Van Bonn. "We've learned a lot from our old ways of doing things, and where that seems to have gotten us is bridges that are cost effective and efficient, but they're just kinda plain-Jane," he said. "There's a physical beauty to the bridge to my eye. It's an elegant and it's simple. We couldn't build this style again." A century after its creation, more than 4,500 cars still drive across Fernbridge every day. They travel a route that is full of scary-sounding engineerspeak, as described in the maintenance report from Caltrans' 2010 checkup. Functionally obsolete. Sufficiency rating: 32 percent. Scour-critical. So is the bridge nearing the end, obsolete and dysfunctional? Say it ain't so. It ain't so, says Andy Coates, an engineering consultant at Report Card for America's Infrastructure, a watchdog group. 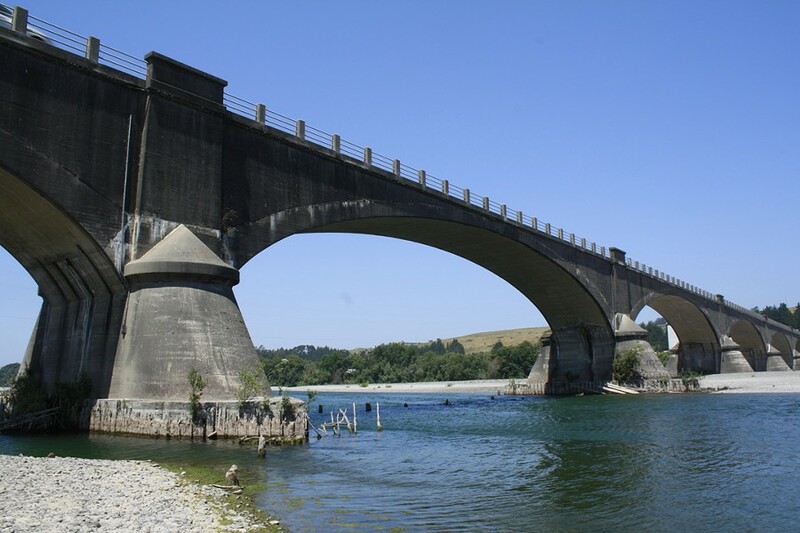 A low sufficiency rating doesn't necessarily indicate bridge safety, he said, especially when it comes to historic bridges, which can be hard to work on and often deviate from contemporary standards on things like shoulders and guardrails. Van Bonn said the bridge's biggest issue right now is scour, which happens when the current speeds up to get around footings and takes sand and gravel with it, leaving depressions in the riverbed next to the footings. Given enough time, scour can undermine the footings and destabilize the bridge. Caltrans is scheduled to fix the problem in 2014 by placing boulders, which are more scour-proof, around the footings. In the meantime, he said, the bridge is perfectly safe. The real purpose of sufficiency ratings, said Van Bonn, is to rank which bridges are most badly in need of federal money for repairs. Bridges that have a sufficiency rating below 80 percent are eligible for federal funding, and a score below 50 percent opens up the option of federal funding to replace the bridge all together. A low sufficiency rating isn't rare among bridges on the National Register of Historic Places. There are around 45 such bridges in California, and of the 21 for which data was easily available, only one bridge had a sufficiency rating above 80 percent. One actually had a score of negative two percent, and the average rating was 47 percent. Fernbridge's low sufficiency rating, Van Bonn said, partly reflects how hard the bridge would be to work on: As the main route in and out of Ferndale, roadwork would be a major hassle for residents. Besides, the rating is low largely because of Fernbridge's narrow lanes with no shoulder and old-fashioned guardrails. "You have to be sober to drive across it,"said Fortuna resident and Ferndale Museum volunteer Norma Dufour, quickly adding that she's never driven it any other way. Still, even a narrow bridge beats the heck out of taking the ferry, which was the most direct way to Ferndale from Eureka before the bridge. So no doubt Ferndalians were thrilled when work on the bridge started on March 28, 1911. Workers first built wooden frames, called falseworks, which essentially formed a negative image of the bridge -- picture giant arches with spaces in between. A temporary railway alongside the wood frame brought concrete from a factory on the east bank that was built specifically for the job. 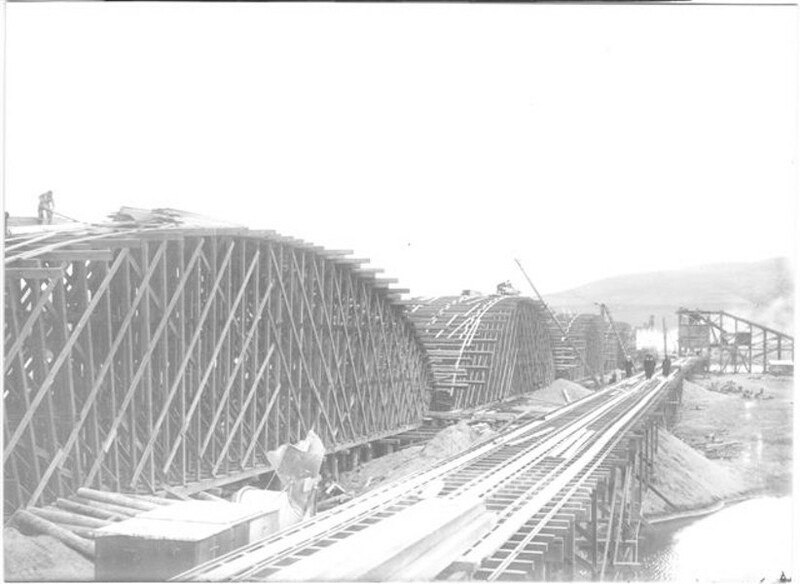 More than 3,600 tons of concrete, 450 tons of steel, and 2 million feet of lumber were used to construct the 1,451 foot span, which was completed on Nov. 8, 1911, less than eight months after work began. November isn't the best time to throw an outdoor party in Humboldt, though, so organizers decided to jump the gun and hold the bridge's 100th birthday party on Aug. 7. Organizer Karen Pingitore said that Sunday's shindig could quite possibly be the biggest party on a bridge these parts have seen in close to a century. The ceremony will commence at noon with some speeches by Caltrans, the Humboldt COunty Board of Supervisors, and staff from the offices of Congressman Mike Thompson and state Assemblyman Wes Chesbro. After that, the Native Sons of the Golden West will perform a ceremony that will consist of a prayer, public mixing of ceremonial grout, and the attachment of a historic plaque to a boulder. Then, officials will close the bridge to traffic, and anyone interested in trudging across can do so. A horse-drawn wagon will follow the pedestrians, as a tribute to the first bridge crossing by a similar horse-drawn wagon 100 years ago. Bringing up the rear will be historic non-horse-drawn vehicles loaded with honorary mayors (read: oldest living persons) representing the various unincorporated towns nearby. After the crossing the revelry will continue in Ferndale with free cake and ice cream. The original bridge bash took place on Nov. 16, 1911, soon after the bridge was completed. In its Nov. 21, 1911, issue, wedged in between a story on President Taft and an article titled "Tyrell Raises Some Good Corn," the Ferndale Enterprise describes the opening and the ensuing festivities. Close to 1,500 revelers were treated to "a big feed of baked beans and other good things," plus a rowboat race, a swimming race from one bank of the Eel to the other, and a "fat man's race" (the dubious honor and $5 prize went to Mr. P. Conway). Pingitore said, "I don't know that we'll get 1,500, but I'm very hopefull that we'll have 500."